A Techie in CHRIST: Why I am waiting on next gen Consoles, and sticking with my PC: A former console player. Why I am waiting on next gen Consoles, and sticking with my PC: A former console player. I went to best buy to further research my newest tech toy I plan to get. (Best Buy is the go to place for hands on preview). I was looking at the surface 2 when I thought, "maybe I should go check out the ps4". I was under the impression I was going to be amazed once I actually get my hands on a PS4 for the first time. I was not amazed. Sure the controller felt awesome, premium in fact liken to something Apple would make if it did video games. I guess Sony has its swag back from the days when Steve Jobs said he wanted Apple to emulate Sony. The adolescent sells guys came by and said , "its awesome right" I responded , "yeah I guess, I mean I am a pc gamer , and got caught into the hype but now that I see it ,,,ummm" he laughed with the interjection, "yeah I'm a pc gamer too". I am now thinking , I am so glad it was sold out when I first wanted it, because now I think I will wait! Sitting at home playing on my pc I got to thinking of why I can wait, hope it makes you think as well. Most games I play are on P.C. anyway.- I looked at the shelf for games I am interested in getting. The only one that stands out to me is the COD. Well thats not good because I can get that on my pc with arguablly better visuals. I defenitly dont want knack. On the xbox side , I hear that ROME is repetitive and boring, I am a FPS guy who pretty much play blockbusters to add to the conversation with my peers. I also play 2k , but once again thats on pc, I know its a port of the xbox 360 but I dont think graphical improvement on the game I own , will push me to a console. I mostly run steam games in big picture mode and sit in my living room using my xbox controller. Yes I know most pc gamers live by the keyboard and mouse, but I am a long time console player who is just used to the controler. I basically have the xbox one in terms of games with windows first console, the computer! 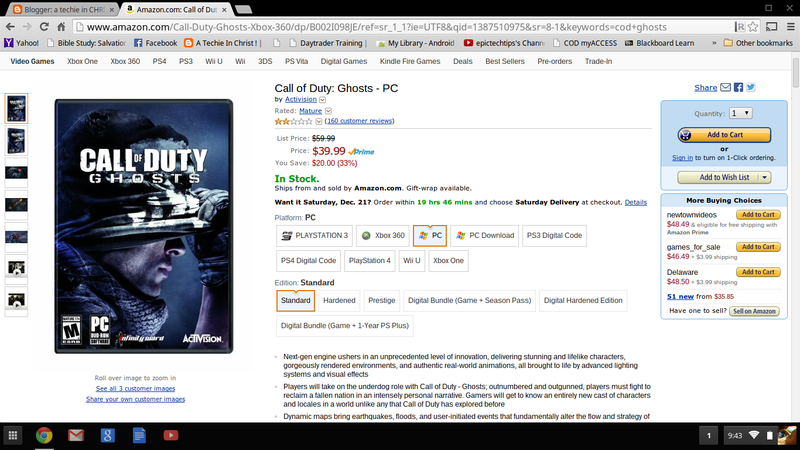 PC games are cheaper after intitial investment. I know people make a big hub bub about how much it costs to build a gaming rig but its overblown. Console makers sell at a lost because they know they will make it up with portions of game sales. Many will point out how you have to keep upgrading your graphics card but I have a hd 7770 purchased for $180 a while back and I can still get 50- 60 fps on my 1080p tv screen. Reviews of graphic cards usually involve powerful monitors, but if you are used to console gaming, 1080 resolution is not taxing on even budget cards. Most games are $59 and that price is pretty constant for most of the year. One of the best things I like about gaming on the pc is the cheap games. Its common place to get fairly new games for $30. 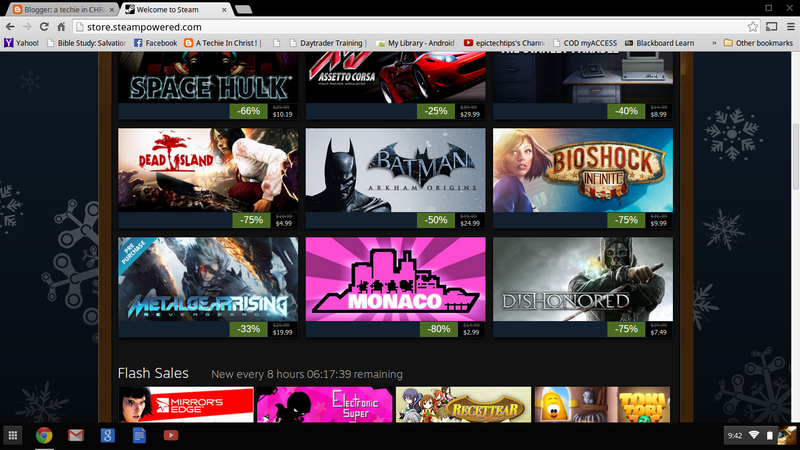 I took this screen shot for example ..
As you see even big games like Batman , and Bioshock is at rock bottom prices! 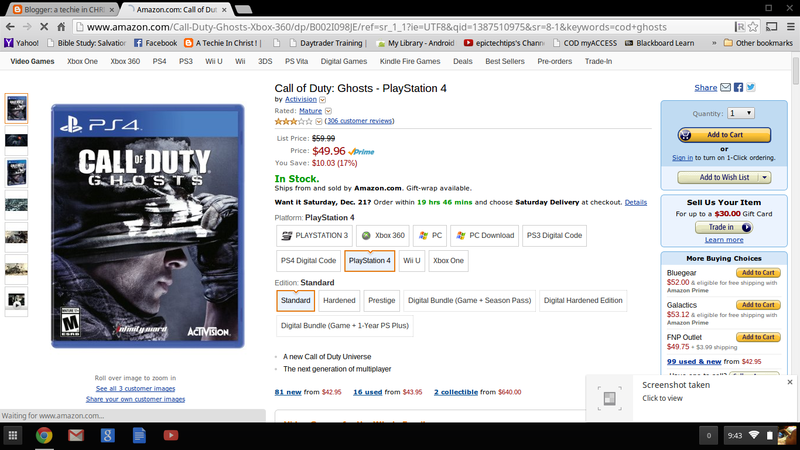 Earlier I mentioned Call of Duty, here top and bottom, the prices are different. During major Steam sales like in the summer and during cyber Monday, you can download blockbusters for $10 like I did for BF3 and Bioshock Infinite. Lets not forget the large quantity of cheap indy games. I don't play it but I like to know I could. I have all my media on my tv connected to my PC . XBMC is my xbox live. I was initially enticed by the media capabilities of the Xbox One. 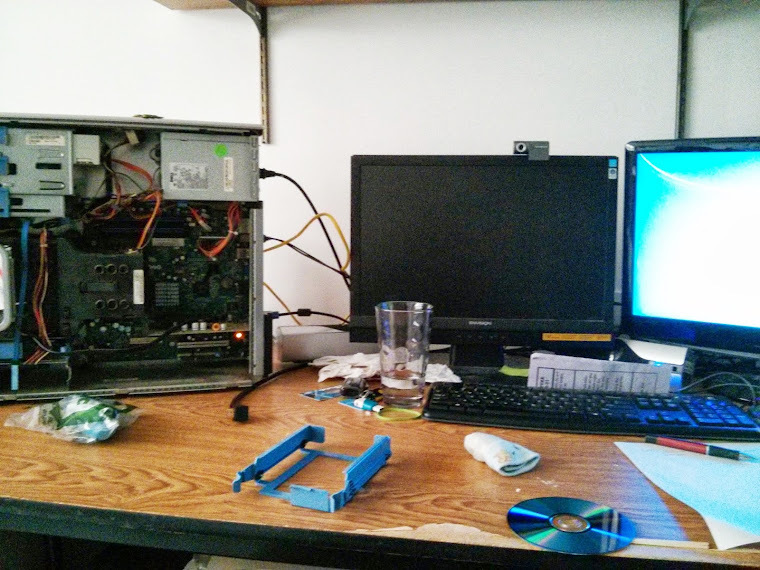 When I came home defeated from a failed attempt to purchase a Xbox One due to it being sold I whent to research how to turn my computer into a home theatre pc. Then I discovered XBMC. WOW . I used it with a combination with a program called PlayOn. The Playon lifetime subscription was less than the price of 1 year of xbox live and it enables me to connect, ESPN, Disney, Cartoon Network, Netflix, Hulu, etc. to any device. In this case xbmc pulls it up. XBMC also allows me to view live tv because I have a antenna hooked through my tv tuner card installed on my pc. The customization's of the media services with XBMC is amazing and too much to talk about here. I will make a post about this later. Of course if you don't have time to do all that you can just bookmark hulu, Netflix, etc to your web browser. I have a remote app on my phone giving me Xbox glass type control of my media. Its awesome! One less device to plug up! I know this is a little week but in a post Steve Jobs/Current Jonny Ive World, minimalism of gadgets is all the rage! I know I hypocritically have a huge desktop which is anything but minimal but I was going to have a pc regardless, why add to it? I also have the pc tucked behind the wall in the next room so all I have my tv visible.